Shop our specialty vendors displaying unique, handmade Native themed arts and crafts. Find that perfect gift for everyone on your list. Visit our Native American Cultural Center Gift Shop and enjoy our photo exhibition gallery The Repatriation of Iron Tail's Possessions: The Face on the Indian Nickel and the collection donated by Dr. Clifford Knapp. Meet and greet other Midwest SOARRING members and share a cup of coffee or hot chocolate. We welcome new members. This gathering is a celebration of the community we build by the work we do. Please bring a side dish to share. Main entries, rolls, and beverages will be provided. The annual members meeting will be held at 5pm. This will be followed by a candlelit walk and the holiday party with dinner and fellowship after the walk. At 7pm we will take turns decorating the Christmas tree with your special ornament. Later, we will hold a holiday split-the-pot raffle. Every year we ask members to bring a gift for those in need. For the children please bring hats, mittens, or a new toy. For adults please bring a non-perishable food item, toiletries, or household goods. We ask each family or individual attending the party to make one holiday ornament to decorate our Christmas tree. We will take turns sharing the special meaning of each ornament and then hang them on our tree. The tree will stay decorated until after the holidays, on display at the Nature Center. This event is free and open to all 2018 Midwest SOARRING volunteers and current members. Memberships can be renewed at the event. All others will be charged a nominal fee of $10 pp. This is a drug and alcohol free event. Join Ron Kanutski for his popular and engaging traditional teachings.Ron Kanutski is a tribal member of the Lake Helen Reserve/Red Rock Band (Obijiwanong). He currently resides in Thunder Bay,Ontario, Canada with his family of seven and is the sole proprietor of With Care Consulting for the past 18 years. Ron actively works in the mental health and addictions field as a consultant, group facilitator, counselor, college professor, trainer, healer and cultural teacher. As a cultural teacher and facilitator, he has worked actively in the United States and Canada. Ron has spent time with Elders of the Woodland tradition and enjoys sharing those teachings to people of all cultures. Light refreshments will follow. Advance ticket price $20 per event, $30 for both events Saturday and Sunday. Tickets at the door $25 for each event. Sorry no refunds. Limited seats. For more info call 708.257.4300. Bring your drum or rattle the last weekend in October to join Ron Kanutski for his popular drum social and traditional teachings. Two different events, one Saturday, one Sunday, held at two differnt locations. Ron Kanutski is a tribal member of the Lake Helen Reserve/Red Rock Band (Obijiwanong). He currently resides in Thunder Bay,Ontario, Canada with his family of seven and is the sole proprietor of With Care Consulting for the past 18 years. Ron actively works in the mental health and addictions field as a consultant, group facilitator, counselor, college professor, trainer, healer and cultural teacher. Advance ticket price $20 per event, $30 for both events Saturday and Sunday. Tickets at the door $25 for each event. Sorry no refunds. Limited seats.For more info call 708.257.4300. Join us to see the movie Neither Wolf Nor Dog at 9:30am Sunday, October 7, 2018. Afterwards, those interested can gather for a bit to eat. Call 630.761.0601 for ticket information. The Join Joseph Standing Bear as he gives his annual blessing of the bison located at Lords Park. Ceremony will start promptly at noon. There is never a charge for the ceremony. Note: all events/exhibits are subject to change. Adults $12, Seniors 62+ $9, Children 3-12 $7. Kids under 3 free. Purchase advance tickets at a discount by September 15, 2018 at www.harvestpowwow.com/tickets.html. Tickets purchased online are not combinable with any other discounts. Pow Wow admission includes access to Naper Settlement during regular hours. Bring lawn chairs. Pow Wow takes place rain or shine. No alcohol or drugs allowed. Sorry, no pets. Your admission fee supports MSF and its programs. Event subject to change. For up to date info call MSF 708-257-4300. The Harvest Pow Wow is partially supported by a grant from the city of Naperville. Programs and exhibits are subject to change. Check back for current updates. Notice to all Pow Wow attendees and participants: There will be professional photographers taking pictures and video recording during the Harvest Pow Wow. With your entrance to the Naper Settlement, you are giving permission for Midwest SOARRING Foundation to use any photos of you which might appear in future promotional materials or advertising used in conjunction with future Pow Wow's. Joseph Standing Bear will lead a talking circle at Noon on March 31, 2018. Doors will open around 11:30AM. Following the talking circle will be a feast. Everyone should bring a dish to pass. Enjoy fellowship during and after the feast. Everyone is invited! Seats are limited. Call 708-257-4300 or email soarring@aol.com to reserve your seat! Which essential oils would fit my everyday routine? How can I save money on essential oils? After the presentation, every attendee will have the opportunity to do an iTOVi scan for a special $10 Midwest SOARRING rate. With this hand held scan, in less than 2 minutes, you get a personalized report of essential oils that would support your body! For the sixth year in a row, Comcast employees will be working with the Midwest SOARRING Foundation members on the Heritage Village property in Lockport, IL. We will assist in land clean-up and preparation for spring, clearing out and preparing areas for sacred planting along with building cleaning and organization. There is work for all ages and interests and we always have such a great day working on the land together! This event will be rain or shine and will have some outside work. Please check the weather and plan accordingly. Lunch and a t shirt will be provided. Your yard tools and cleaning supplies are welcome. The Midwest SOARRING Foundation Pow Wow photography exhibit featuring images from Midwest SOARRING Pow Wows will be on display at the Lisle Library from April 5 until May 31st. Through this work, we seek to inspire appreciation for Native American culture alive today. An artist reception is scheduled for Friday evening, April 13th from 6-8pm. Special guest, Abby Lyons will attend as the Midwest SOARRING Princess. All are welcome. Joseph Standing Bear will lead a talking circle at Noon on March 31, 2018. Doors will open at 11:30AM. Following the talking circle will be a feast. Everyone should bring a dish to pass. Enjoy fellowship during and after the feast. Everyone is invited! Come celebrate the Spring Equinox with Joseph Standing Bear. He will have a ceremony on Tuesday, March 20 at 11AM. The ceremony will be held at Heritage Village, 2nd and State Street, Lockport, IL 60441. For more info call 773-585-8613 or email soarring@aol.com. OUR FIRST 2018 POW WOW MEETING! Of course, if you have held one of these positions before, we would love to have you volunteer again! Just please contact us to advise of your commitment by calling 708-257-4300 or email: msfpowwow@aol.com. If you do not have the time to run an Area, but want to volunteer, please attend the meeting! We would love to hear from you. Save the date: The 24th Annual Harvest Pow Wow will take place on September 22 and 23, 2018! Stop by the Cultural Center this Saturday, March 10, as we will be open from 11AM to 3PM. Visit with Joseph Standing Bear and other MSF members and friends. We have some new items for sale, so be sure to browse our gallery. If you make a purchase from a local business that is a member of Lockport's Chamber of Commerce (which SOARRING is..) on the second Saturday of the month, you can submit your purchase to the chamber and get in on this month's raffle prize in celebration of the event called SECOND SATURDAY! Coffee is always available! Looking forward to seeing you there! For more info call 708-257-4300. We are planning a trip to see the new movie Hostiles. The show time will be announced by Friday, January 26, 2018. Everyone will purchase their own tickets.Those interested in going out for pizza or something to eat afterwards, can enjoy a meal together. Come, let's start the New Year with our first fun activity! Any questions please call 708.257.4300. Join Joseph Standing Bear Schranz to honor the Winter Solstice in ceremony. We look forward to seeing you and your friends. 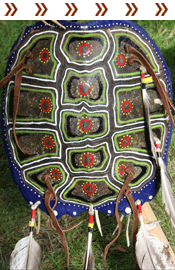 Shop our specialty vendors displaying unique handmade Native themed arts and crafts. Find that perfect gift for everyone on your list. Visit our Native American Cultural Center Gift Shop and photo gallery exhibition on The Repatriation of Iron Tail's Possessions: The Face on the Indian Nickel. Meet and greet members of Midwest SOARRING Foundation. We welcome new members into our circle. Come and share a cup of coffee or hot chocolate with us. Holiday "Split The Pot Raffle". Every year we ask our members to bring items to share with those in need. For the children, please bring winter hats, mittens, or a new toy. For the adults, please bring a non-perishable food item, household goods, or toiletries. These items will be delivered to families in need. The event is open and free to all 2017 SOARRING Volunteers and Current Members. Memberships can be renewed at the event. All others will be charged a nominal fee of $10 per person. This is a drug and alcohol free event. RSVP 708.257.4300 or email soarring@aol.com. We look forward to seeing you at this special gathering. Bring lawn chairs. Pow Wow takes place rain or shine. No alchohol or drugs allowed. Sorry, no pets. Your admission fee supports MSF and its programs. Event subject to change. For up to date info call MSF 708-257-4300. The Harvest Pow Wow is partially supported by a grant from the city of Naperville. Notice to all Pow Wow attendess and participants: There will be professional photographers taking pictures and video recording during the 20th Annual Harvest Pow Wow. With your entrance to the Naper Settlement, you are giving permission for Midwest SOARRING Foundation to use any photos of you which might appear in future promotional materials or advertising used in conjunction with future Pow Wow's. For the 5th year in a row, Comcast employees will be working with Midwest SOARRING Foundation volunteers at the Heritage Village location in Lockport, IL. Together Comcast employees and SOARRING members will assist in land clean-up and preparation for spring, which involves clearing out and preparing areas for sacred planting along with building cleaning and organization. There is work for all ages and interests and we always have such a great day working on the land together! The Heritage Village is located at 249 West 2nd Street, Lockport, IL. Sign up ahead of time to reserve your teeshirt and lunch choice at Comcast in the Community (https://www.comcastinthecommunity.com/Project/Detail?projectId=8742). If you have questions please contact Sharisse Sheridan at 630.568.3501 or by email at Sharisse_Sheridan@cable.comcast.com. We look forward to seeing you on April 22nd.